ePublishing Knowledge BaseePublishing Knowledge BaseePublishing Knowledge Base PollsHow do I search for a poll? 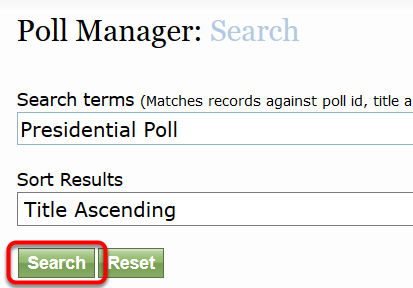 To find an existing poll, click SEARCH & EDIT next to Poll on your dashboard or within the Poll Manager. To search, type search terms into the top field, including poll ID#, title or questions. To select a poll, click on the poll title in the search results. Results show whether a poll is published or unpublished. Find the Poll Manager under Editorial on your dashboard. 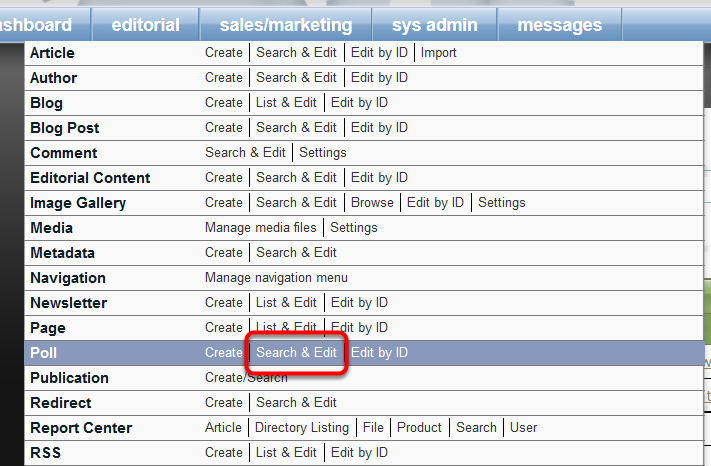 Click Search & Edit. 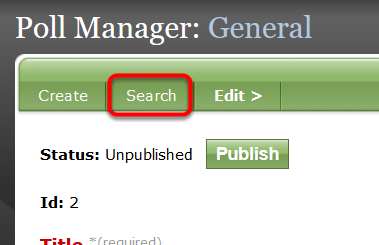 OR click Search when you are in the Poll Manager. Type your search terms in the Search Terms box at the top. Select how you want your results sorted in the dropdown menu. Zoom: Type your search terms in the Search Terms box at the top. Select how you want your results sorted in the dropdown menu. To open a poll, click on the title in the search results. Zoom: To open a poll, click on the title in the search results. To duplicate a poll, click Duplicate. Zoom: To duplicate a poll, click Duplicate. Prev: How do I create a poll? Next: How do I duplicate a poll?